Sometimes when you’re going through a rough period in life, you need someone to sit you down and tell you everything is going to be okay. While hosting Saturday Night Live last night, Tom Hanks — aka, America’s Dad — told us it was going to be okay, and we already feel better. During his monologue, Hanks conceded the fact that he is America’s dad. In embracing that role, he traded his dress coat for a sweater so cozy that Mr. Rogers would be jealous, and sat America down for a little chat. In the sit-down, the Sully actor spoke to us about issues like our debt, guns, and our marijuana use in a charming, yet effective manner. Like a true dad, Hanks reminded us that we’re great and reminisced about some of our best inventions, like the internet and cannons that shoot t-shirts. The monologue was just part of an incredible SNL episode. 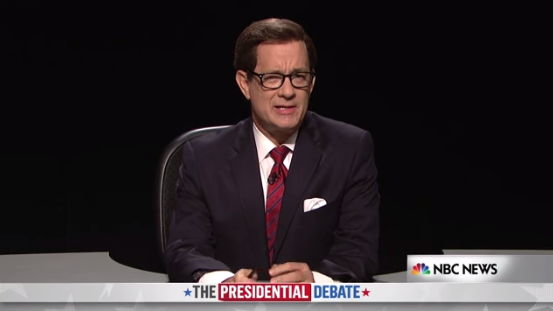 Hanks had a rousing take on third debate moderator Chris Wallace in the cold open and spoofed his Inferno director Ron Howard in a sketch about America’s funniest pets. In the recurring Black Jeopardy sketch, the Inferno actor played Doug, a Trump-supporting Jeopardy contestant who does surprisingly well on Black Jeopardy. He even took on his own movie Sully in a sketch in which Hanks as Sully struggles to be second in command. The sketch that stole the show was was a haunted elevator sketch featuring Beck Bennett and Kate McKinnon as a couple who fail to be frightened by Hanks’ David S. Pumpkins, until a surprise twist at the end. The bizarre sketch quickly became a favorite and was something only Hanks could have turned into an instant Halloween classic. With so much anger and frustration plaguing the U.S., it’s heartwarming to see Tom Hanks bring us back together for one night only. He really is America’s dad!